Fact sheet to help with making insurance claims and resolving disputes with financial service providers. 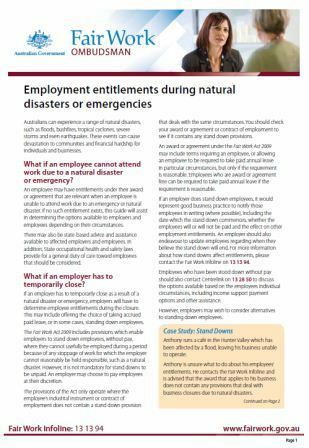 Facts sheet for NSW private sector workers on workplace rights during natural disasters and emergencies. Factsheet about your pay and stand down during severe weather. Fact sheet explaining flood insurance in plain and easy to understand language. What can I do if my home and/or contents insurance claim is refused? Fact sheet with case study that describes the options available when a claim is refused. Information about insurance for people that may be affected by natural disasters. Information about FOS processes and procedures relating to insurance claim disputes relating to floods. 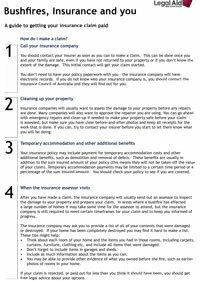 Information about tenants rights in the event of storm damage and floods. Fact sheet for individuals and small businesses unable to meet repaytments under a credit facility. Fact sheet providing some basic information to bank customers about how to manage their debts if their income or property has been adversely impacted by a natural disaster or catastrophic event. Fact sheet about the Australian Government Disaster Recovery Payment and how to claim the payment. Information about financial assistance for household contents and structural repairs to homes. Information for primary producers and small business operators affected by flood/fire/storm damage or any other declared natural disaster. This fact sheet provides a quick guide for getting your insurance claim paid. How are bushfires and insurance related? Does my insurance policy cover me for bushfires? What are typical issues to consider in bushfire insurance claims? What can I do if my claim is refused and how do I raise a complaint? Fact sheet on website with case study that deals with amongst other things making claims when you live in a bushfire prone area. LawAccess Online has plain language legal information including factsheets and guides to help you with your legal issues.